Having your own pressure washing equipment is a good investment for the future of your business. While some owners start out renting their equipment, sooner or later it just makes more sense financially and practically to own your own. Before you invest in your own pressure washing tools, however, it’s important to keep in mind some important facts. For starters, it’s a good idea to have a basic pressure washing equipment list to shop with. Gear including nozzles, hoses, gloves, uniforms, etc. While every business owner looks to cut costs whenever that’s an option without compromising on quality, there are some things you just shouldn’t skimp on. You can save money on the smaller supplies like the surface cleaner, since one brand won’t have any major benefits over another. However, bigger ticket items, like the washer itself, are another story. Professional pressure washing equipment and supplies will last longer, do a better job cleaning, and ultimately pay for themselves in the long run. Essentially, this is not an area where you want to cut corners. That being said, a higher price tag doesn’t automatically translate into better quality. Weigh your options, read online reviews, and do some comparison shopping before you select your ideal pressure washing tools. Sometimes, you can get the same power and quality for a brand or model with a lower price tag. This is especially true for some of your replacement equipment, like hoses, valves, and spray guns/tips/lances. PRO TIP: Comparison shop, and don’t go for pressure washing accessories simply because of a higher price tag, but because of the actual quality of the materials. While on the subject of price tags, it’s important to know what those numbers mean. Are you paying for that important brand name splashed against the side of your equipment, or is there something else that comes along with the price? Some companies roll the price of the warranty into the overall cost of the machine. This is an essential factor to look for. A product warranty can save you thousands of dollars if an item is defective or breaks after only a short time being used. A pressure washer that has a higher price tag but comes with a longer or more extensive warranty might just be worth every penny. Some of your replacement items should also come with warranties, especially the hoses, pumps, and nozzles, but also smaller pieces such as rings and adapters. PRO TIP: Spend more on a good warranty to stay covered longer. Of course, a product warranty will only cover your pressure washing equipment in certain limited circumstances. If you really want full coverage, you’ll opt for equipment insurance. 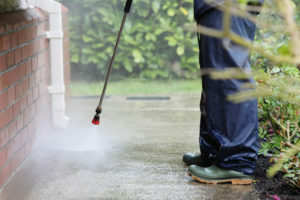 This type of insurance not only covers you in the event that you purchased a faulty or defective pressure washer, but it will also compensate you for other mishaps or issues that might arise. The important difference between the two is that equipment insurance covers you over a much broader range of eventualities than a standard warranty. PRO TIP: If you want to be safe and smart, invest in an equipment insurance policy for your pressure washer. Finally, entrepreneurs like you should take advantage of the most up-to-date tools at your disposal, including digital tools. You’ll find apps to help you create estimates, generate leads, invoice customers, and chat with other power washing companies for brainstorming and advice. And don’t forget regular salary, calendar, appointment, customer management, and supplies management apps. Buying wholesale. Wholesalers can afford to sell you the same pressure washing equipment you find in the stores for less because they’ve cut out the middleman. This would be a good way to buy the bigger tools in your arsenal, especially the pressure washer itself and replacement hoses, spray guns, valves, pumps, spray tips, adapters, and more. Buying in bulk. Buying a year’s supply of supplies will make the overall costs lower. You can easily buy cleaning solutions and towels/cloths in bulk. Waiting for off seasons. If you can afford it, wait for the off-season sales to make the most out of your savings.